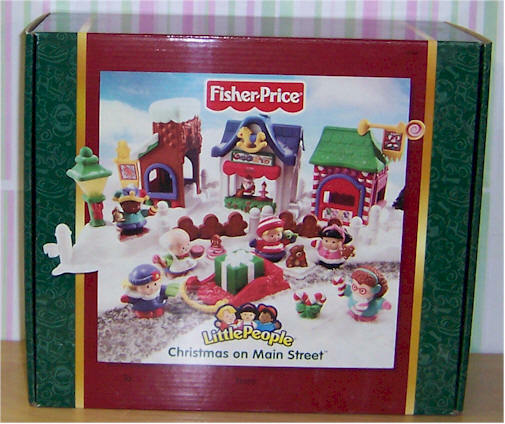 Fisher Price New Items for Christmas - All come in a Box. 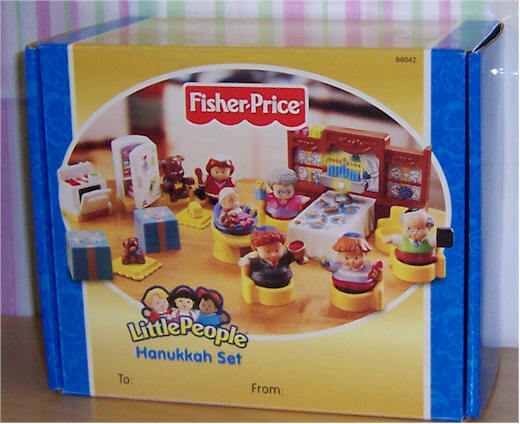 Celebrate the miracle and traditions of Hanukkah, The Festival of Lights, with this special holiday play set featuring a light�up, musical menorah. Cook a holiday meal in the kitchen and gather the family around the dining room table decorated with fine china, holiday food and gelt. Light the menorah�the candles glow and it plays a Hanukkah tune! Includes seven figures, stove, refrigerator, chairs, bed for the family dog and two presents that really open. Cabinet wall approx. 4�"H. Requires 3 �AA� batteries. Set includes the Little People as Santa, Mrs. Claus, Elf, A Christmas Tree, Sleigh, 3 houses; including a Gingerbread Bake shop, Post office, Toy Shop, and a present that opens into a cute puppy. 9 pieces total. In this cute village you can mail a letter to Santa at the post office, open the present to reveal a precious puppy, visit the bakery, toy shop or post office. You press down on the Christmas Tree star to hear "Oh Christmas Tree"! Comes in a brown box. Main Street is bustling with the excitement of the holidays! Christmas is in the air, especially when you press the lamp post�it really lights and plays a holiday tune! 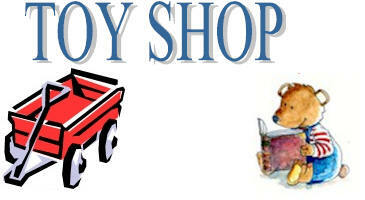 Five Little People� friends are bundled in their warmest winter wear, ready to carol up and down Main Street visiting the Toy Shop, Candy Store and Baker Bob� at the Bakery. Includes two gingerbread man fences, sled and three presents with an interchangeable box top. Approx. 24"L x 8"W x 8"H. Requires 3 �AA� batteries. 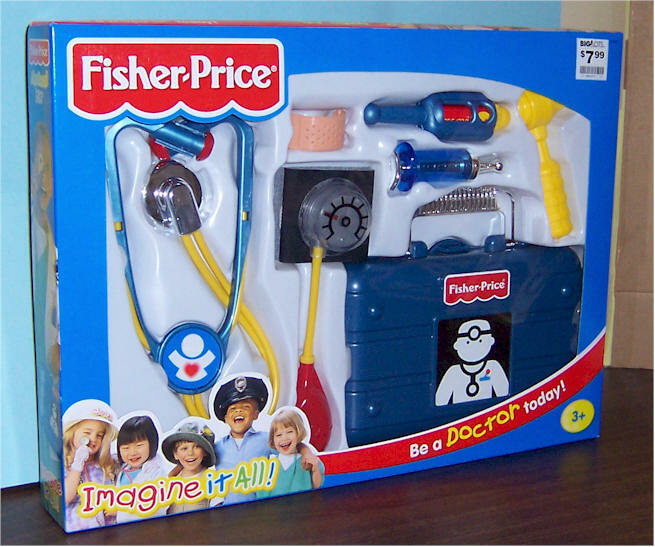 Fisher Price Medical Kit. Working Stethoscope, Magnifying horoscope, Spring-loaded syringe, Bracelet-style bandage, Blood pressure cuff with spinning gauge. 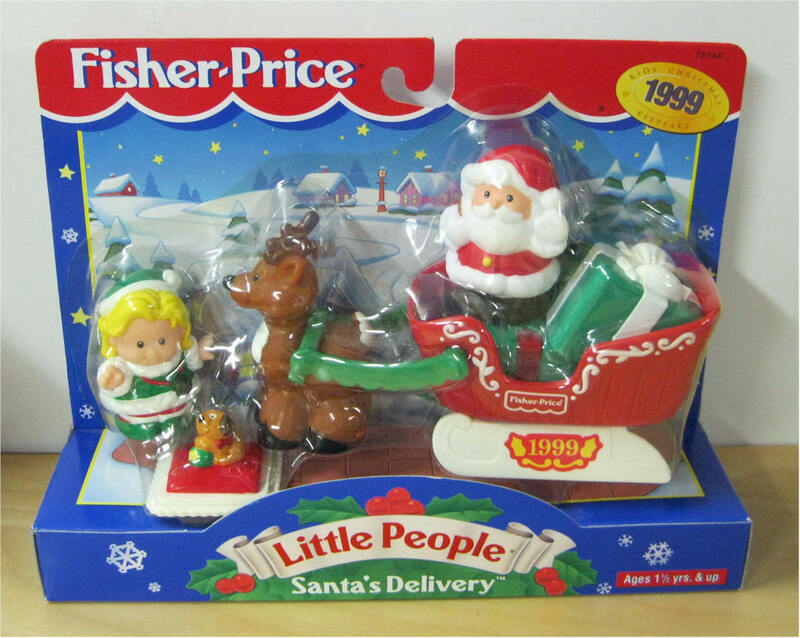 Fisher Price Little People Santa's Delivery. What Fun kids will have on Christmas day, when Santa arrives in this wonderful sleigh. An adorable elf and a reindeer come too, with a specially-wrapped gift just for you. Open the present to find puppy insider. Brand new in box. 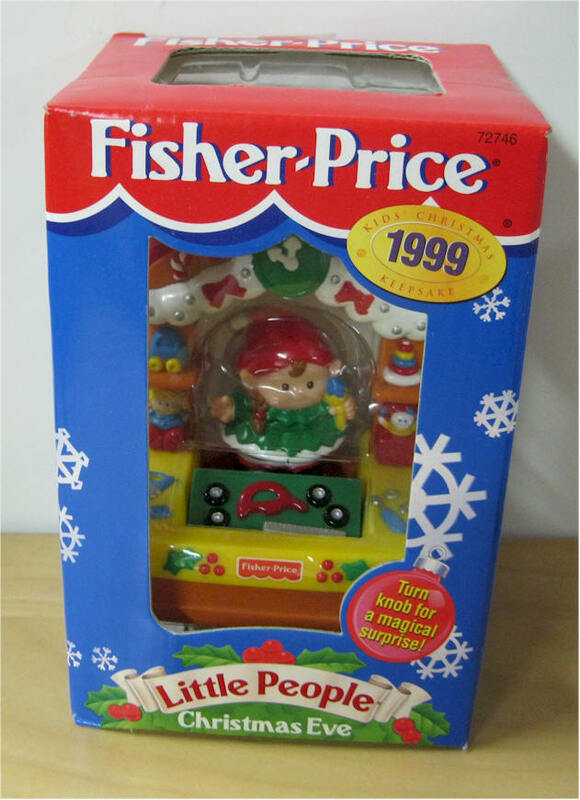 Fisher Price Little People Christmas Eve Ornament 1999 with Santa's Workshop Elf. Brand new in box. 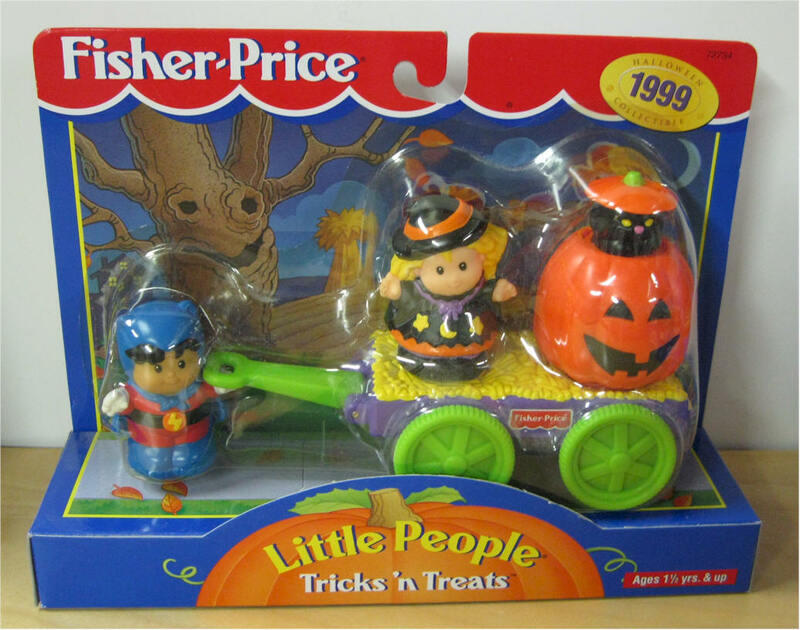 Fisher Price Little People Tricks n' Trick. It's such a spooky time of year but you won't want to hide, cause this wagon's on its way with a fun surprise inside. Roberto's dressed as a super hero and Sarah Lynn's a witch, in disguise.